This Solid White Nautilus Grace Glass Bubbler can offer you an extraordinary experience of smoking! It is a beautiful piece of glass art, made of high quality heat proof borosilicate glass, formed in the shape of a multi-chamber tube. It comes with a slit diffuser percolator, for an extra-bubbly smooth toke. A built-in slit diffuser filters your smoke. The diffuser ends up in a sure ground of 18.8mm diameter, that connects to a bowl for placing your herb or tobacco. The bowl has a handle that makes it easier to use, as long as you can lift it up and clean it at your convenience. 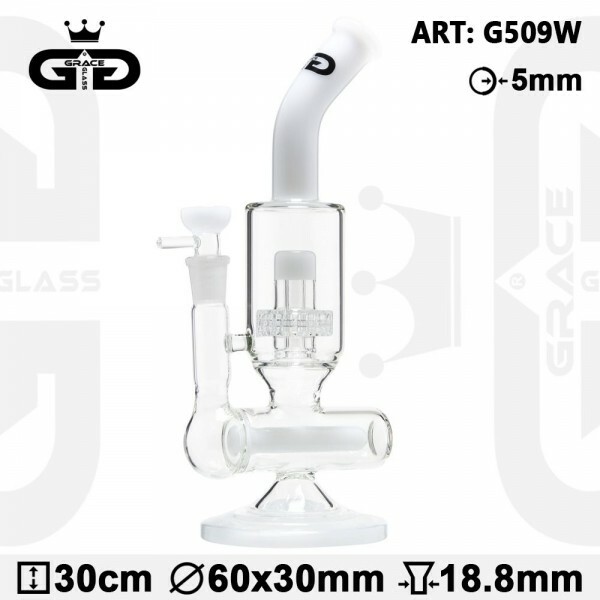 With the Grace Glass logo featuring at the top of the tube, the whole set-up ends up in a mouthpiece ring through a bent neck that will offer you a more comfortable grip in addition to a funny sense or smoking!